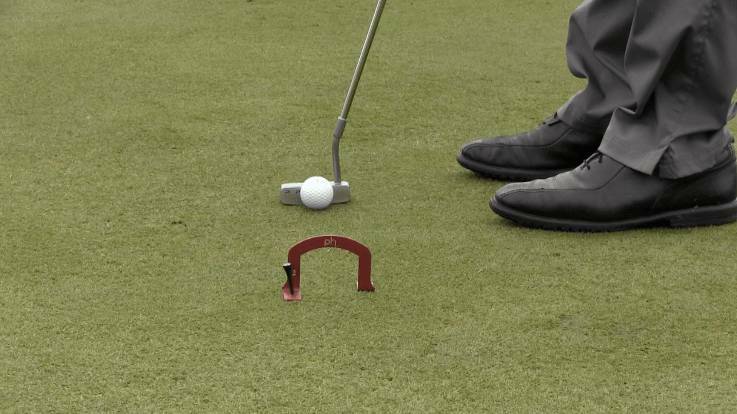 Who wouldn’t love to improve their putting and start making putts more consistently? The better you are at making putts, the better your scorecard looks. Unfortunately, a lot of golfers find themselves shooting the same scores over and over again with no idea how to get off the green in fewer strokes. If you relate to this problem, I’m here to help. I am going to share with you the one key skill that you must master in order to be a better putter. I will also share three drills designed to help you practice this skill. But first, I’d like to take a step back and look at the big picture, including five key concepts that you need have down in order to develop that one “King of the Hill” skill. The information I share here is all data-driven, collected from our putting system, the Quintic Putting System. Through the Quintic System, we’ve gained a clearer understanding of how and why the ball rolls the way it does. I’ll spare you the academic language and keep this simple. Just remember, these concepts are not based on my opinions or preferences. Rather, they are developed from scientific data. Before you can master the one key skill that will help you master the putt once and for all, you need to have a solid foundation in the fundamentals of a quality putt. Review these five key concepts to make sure you have the basics down. The quality of your putt begins with the quality of your setup. Both the alignment of your body and the placement of your ball can make or break your efforts on the green, so if you think you may need help with your setup, check out this video. If the ball hits the toe of the clubface, it veers to the right. 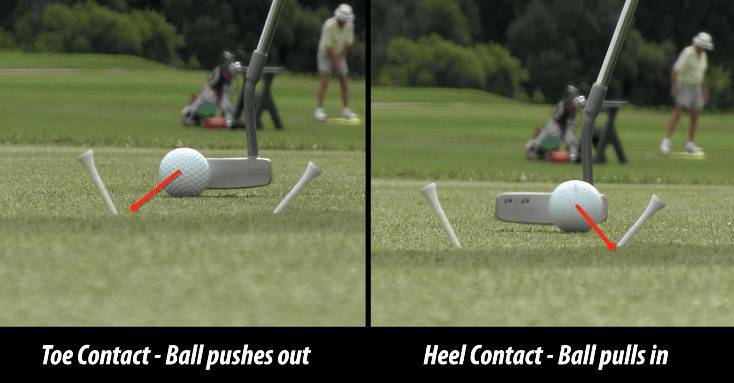 If the ball hits the heel of the clubface, it veers to the left. Either way, you miss your shot. You always want to make contact at the center of the clubface. If you prefer to swing straight back and straight through, you should use a face balanced putter. 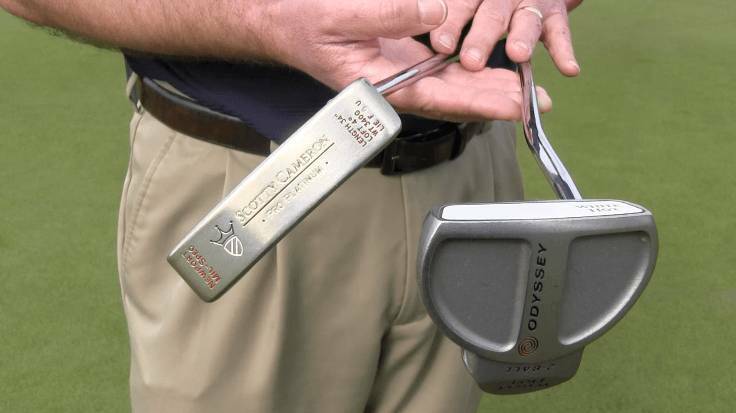 If you prefer to swing with more of an arc, you should use a putter with a toe hang. If you’re struggling with distance control in your putting, odds are you’re launching the ball too high. The optimum launch angle is around one degree. If you launch the ball much higher than that, you’ll cause the ball to bounce and you will lose control of how far it travels. The speed of your swing doesn’t matter as long as you have consistency and symmetry. The clubhead should glide into the ball, rather than accelerating or decelerating into it. It may help to think of your putter head as a car driving down the road at a steady pace. A car travelling at 50 miles-per-hour doesn’t suddenly slow to 20, and a car travelling at 20 miles-per-hour won’t accelerate to 50. Your stroke should work the same way. Once you have mastered these five concepts, you are ready to focus on the one key skill that will help you finally sink more putts. The most important skill in putting is face control. Face control refers to the angle of the clubface at the moment of impact. Ideally, the putter face is square to the target when it hits the ball. There is some margin of error when it comes to face control in putting, but it’s a very thin margin. 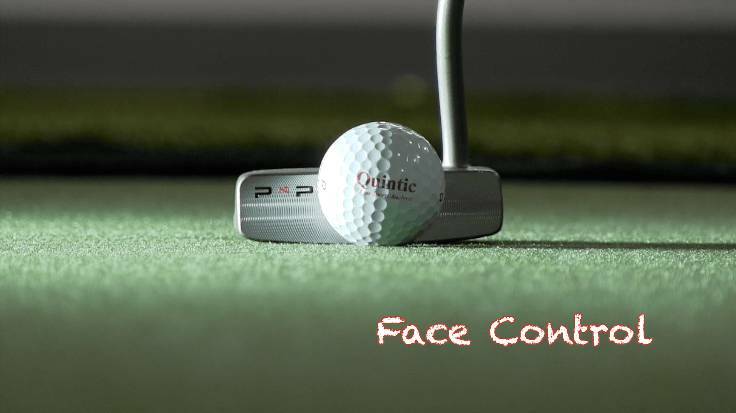 Face Control is King of the Hill in making putts consistently. Without it, everything else breaks down quickly. Let’s think in terms of a seven or eight-foot putt. This is a common putting distance, either as a second putt or after a good chip shot popped the ball up onto the green. At a distance of seven or eight feet, your putter face cannot be off by any more than one degree. In other words, the face can be either one degree open (aimed to the right of the target) or one degree closed (aimed to the left of the target). Any more than that, and you will most likely miss your shot. While you can get away with an error of one degree, the gold standard is ½ degree. That level of precision is what enables tour professionals to sink putts of up to nine feet. For now, start with focusing on nailing that one-degree consistency. Here are a few drills to help you practice. What better way to practice precision than with a laser? Position the laser so it creates a line leading straight to the target. 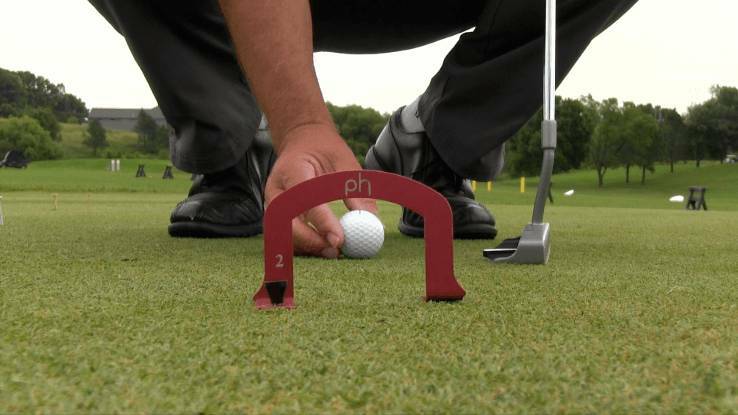 Center your ball on the laser line, then center your putter face along the laser as you make your putt. 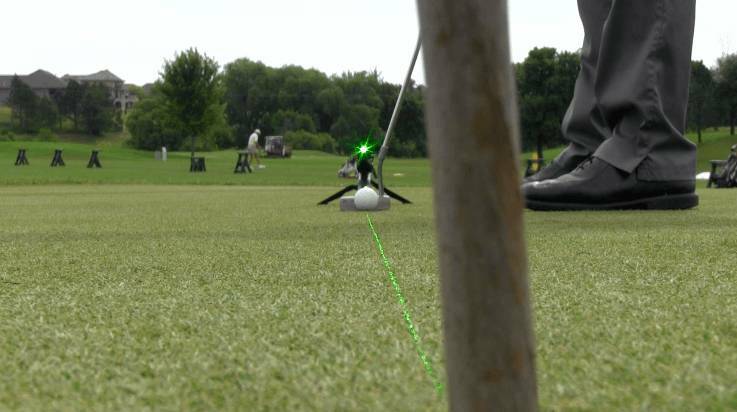 Not only does the laser help you see if and how much your putt veers from the path you intended, but it also gives you a clearer visual of face position when you hit the ball, helping you make sure that the face is square at address. So, where do you get the laser for these drills? At the Todd Kolb Golf Academy, we use the Laser Optics v. II from Wright Putting Dynamics. 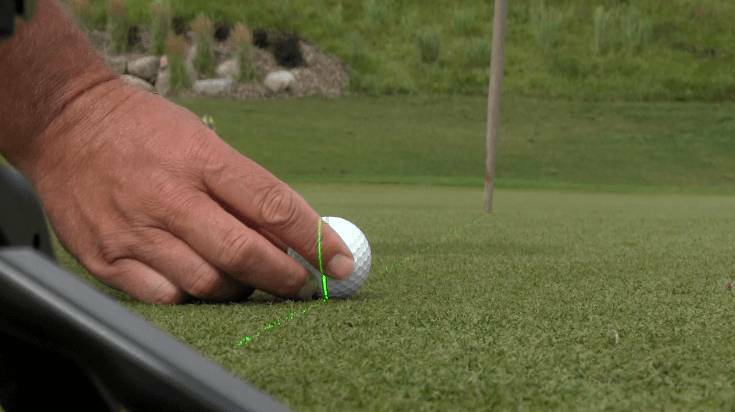 This high-tech laser costs around $100 and is designed specifically for putting practice. It can be used outside and is a fantastic option if you’re a frequent golfer who is serious about improving your putting. However, if you’re looking for a less expensive option, a $10 laser from your local hardware store works great for practicing indoors or on a cloudy day. Similar to the laser drill, the ruler drill helps you visualize the path of your ball and the direction of your putter face. At the academy, we use The Putting Stick, but a standard ruler from your hardware store works just as well. Make sure that the ruler is no less than one inch wide. If you’re fairly new to golf, you may want to look for something wider than one inch. 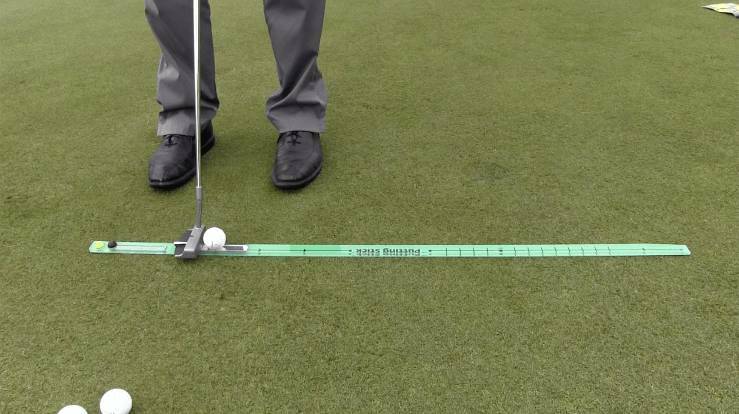 Once you have a ruler or putting stick, line it up so it creates a path toward the target, then practice putting the ball so it rolls straight down the center of the ruler. This drill can be tremendously frustrating at first. It’s much harder than it looks. However, with a little diligence, this drill is a great way to master face control. The goal of the gate drill is to roll your ball through a gate. As with the previous drills, you can purchase a gate designed for putting practice, or you can easily create your own using tools you already have. We like to use gates designed by Quintic, and they come in a variety of sizes so you can choose one according to your current level of skill. Another option is to create a gate using tees. Simply place two tees in the ground about a putter head’s length (or two golf balls) apart from one another. Then, position your ball no more than one putter’s length away from the gate. If you are just starting out, you will probably want to place your ball a little less than a putter’s length away. Practice putting the ball through the narrow gate you’ve created. As you try each of these drills, you may get a little frustrated. You may discover that your face control is weaker than you thought it was. Hang in there. 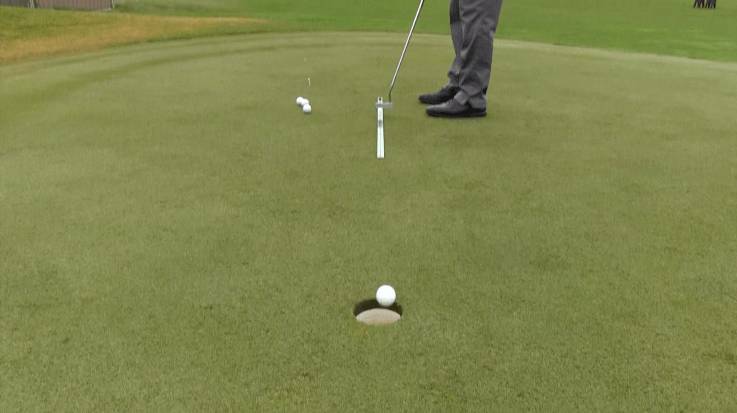 With more practice, discouraging drills become incredible tools to transform your putting. Now that you know how to master face control, you may be wondering how to get a handle on those Five Key Concepts listed at the beginning of this article. Follow the links in the concept descriptions to find more in-depth information, drills, and tips. And stick with us! We’ll continue to share videos and blogs outlining everything you need to know to improve your putting and lower your golf scores. In the meantime, drop us a line in the comments. Let us know what’s working for you, what you disagree with, and what questions you still have. Your feedback helps us design content tailored to your needs and priorities, so let us know what’s on your mind! Ready to start shaving strokes off your rounds? Find Your Tour Precision today!